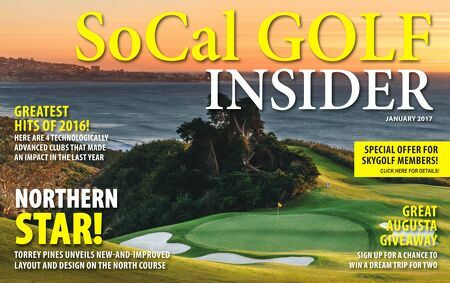 SoCal GOLF INSIDER JANUARY 2017 NORTHERN STAR! tORREY PInES unvEILS nEW-And-IMPROvEd LAYOut And dESIGn On thE nORth COuRSE GREAt AuGuStA GIvEAWAY SIGn uP FOR A ChAnCE tO WIn A dREAM tRIP FOR tWO GREAtESt hItS OF 2016! hERE ARE 4 tEChnOLOGICALLY AdvAnCEd CLuBS thAt MAdE An IMPACt In thE LASt YEAR SPECIAL OFFER FOR SKYGOLF MEMBERS! CLICK HERE FOR DETAILS!